The 360 flip combines two tricks, the kickflip and the 360 shove-it. Even if you can't do a 360 pop shuvit, don't fret. You should, however be familiar with the plain ol' backside pop shuvit. 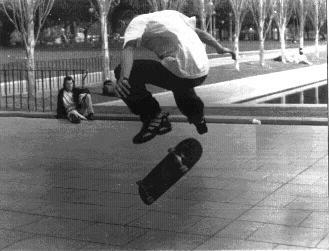 To do a 360 flip, you should position your front foot like you would for a kickflip, with your foot slid back toward the heel-edge of the board and also further back lengthwise. Your rear foot should be positioned with your toe on the toe-edge of the tail. Rolling at a moderate to slow speed for learning, sweep your back foot behind you, pushing down just enough to get the tail to smack against the ground as you sweep. This will rotate the board around 360 shuvit style. Within the same motion as the sweep, make your front foot do a kickflip. The whole thing should take about the same amount of time a kickflip does, so you won't have to "hang" in the air any longer. When the nose comes back around and the griptape side shows upward, stick your feet back on and land it. Before you learn this trick you need to know how to ollie. The kickflip is an ollie variation: you jump into the air with your board, but your board does a flip before you land on it. Step 1: Your back foot goes on the tail and your front foot goes in the middle of the board, but hangs a bit over the edge. Step 2: Do an ollie, but rather than only sliding your front foot upward and forward, you must also slide your foot (shoe) to the heal side enough to start your board in a spin. This action requires you to actually kick your front foot off of your board. The spinning board hovers for a second between your sprawling, supple legs. With both your feet on the board, lift up the heel of your back foot so your weight is on the ball of your foot and your toes. That part of your foot should be centered at the tip of the tail. Your front foot should be about 2/3 of the way up the board, angled slightly forward. Your toes should be near the toe edge of the board and, depending on shoe size, your heel may be hanging off of the heel edge. Smack the tail to the ground with your back foot and jump off of that back foot--getting the timing down is probably the hardest part. As you jump, your front foot slides up to your nose, pulling the board into the air. At the peak of your ollie, level out your board, then wait for the landing. Always land with your knees bent. When ollieing a gap, try not to think about clearing it; instead, think about popping a nice big ollie. The hardest part about ollieing most gaps is getting in the committed mindset. When you're in the air, spot your landing and keep those shoes on that grip tape until you roll away.